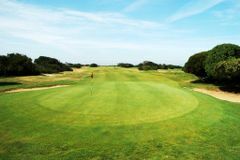 The Oporto Golf Course is located 17 km to the south of Porto city beside the beautiful beaches of Espinho. Oporto Golf Club, after Pau, in France, the second oldest course in Continental Europe. It was established in 1890, when British residents in Porto created the club. When Oporto Golf Club started- in 1890 – Porto’s second most famous export hadn’t even begun. Like in any old golf course, Oporto’s greens are small but challenging and the closest to a links you’ll ever find in Portugal. In general terms you can prepare for a pleasant but competitive ride, not advisable for high handicaps.Play during the summer and you may be tempted to swap the 19th hole for the beach. A flat rather uninteresting course that had not been well maintained.